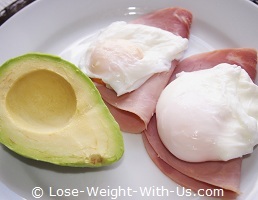 Start your day with one of these low carb easy breakfast recipes, they are very filling and will keep you satisfied for a long time after breakfast. For each diet breakfast recipe below, the nutrition profile has been calculated, and the net carbs are shown. First of all, we will cook the asparagus. Fill a large saucepan with 3 inches of water and bring to the boil. Add the asparagus and boil for 3-4 minutes, then empty the pan into a colander and rinse under cold running water, drain and set aside. We will cook the eggs next. Place the eggs in a small saucepan and cover them with water, bring the water to the boil and continue cooking for 6 min for a semi cooked yolk and 7 min for a cook through egg. 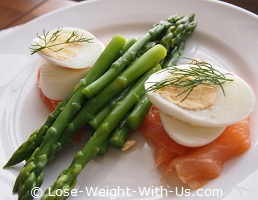 Cool the eggs immidiatly under cold running water, peel the egg shell and serve the eggs with smoked salmon and asparagus. Calories: 188 kcal; Total Fat: 10g (Sat Fat 2.8g); Cholesterol 287.6mg; Sodium 1,305mg, Total Carbohydrates: 2.7g; Dietary Fiber: 1.3g; Protein: 22g. There are a few ways of cooking poached eggs to perfection – adding vinegar, using egg poachers, etc. We will be creating a whirlpool in the water. First of all, we will fill the sauce pan with 15-20 cm of water, add salt and a dash of vinegar, then bring the water over a medium heat to simmer. Crack the eggs onto a saucer. Using a spoon, stir the simmering water in one direction creating a whirpool effect, then slide the eggs from the saucer into the center of the whirpool. Cook 2-3 min for runny yolk, and 3-4 min for semi soft yolk. Use a slotted spoon to remove the eggs from the saucepan. Season with salt and black pepper, serve it with ham and ½ avocado. Calories: 287 kcal; Total Fat: 22g (Sat Fat 4.5g); Cholesterol 288mg; Total Carbohydrates: 7.8g; Dietary Fiber: 5.9g; Net Carbs: 2g, Protein: 17g. 1 tbsp. of fresh dill, chopped. Wrap a slice of smoked salmon around 1 tbsp. of cream cheese and sprinkle the cheese with dill on both sides. Repeat for the other roll. Use a potato peeler to shave the cucumber lengthwise, make 4 long shavings, which you can fold in half creating a loop. 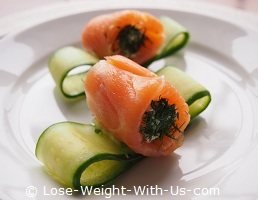 Place the cucumber loops on the plate forming a bow with the smoked salmon and cheese rolls in the middle. In a bowl, whisk an egg and an egg white together with 4 tbsp. of water and salt. 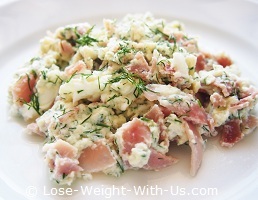 Mix the dill, ham and eggs together. Preheat a non stick frying pan over a medium heat, melt the butter and pour the egg mixture, stirring constantly till the eggs are set. Serve hot. 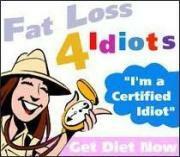 Calories: 140 kcal; Total Fat: 8.4g; Cholesterol: 184mg; Total Carbohydrate: 0.6g; Net Carbs: 0.6g; Protein: 16g. Place the eggs in a small saucepan, add cold water and cover the eggs by 1 cm (1") and bring the water up to simmering point. Cook the eggs for 6 min if you like the egg yolk to be a bit soft in the middle and 7 minutes for a hard-boiled egg cooked all the way through. Cool the eggs immediately under cold running water, run the cold tap over the eggs for 1 minute and leave them in cold water for 2 minutes before peeling the shell off. 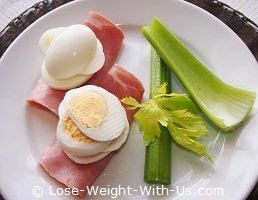 Serve the eggs with ham and celery stalks. Calories: 151 kcal; Total Fat: 9.6g; Cholesterol: 295mg; Total Carbohydrate: 2.4g; Dietary Fiber: 0.6g; Net Carbs: 1.8g; Protein 16g. This recipe takes a maximun of 5 min to cook providing you use ready made Hollandaise sauce. We need to steam the spinach and poach eggs at the same time. First of all wash the spinach thoroughly then place in a large frying pan over a medium heat with a little water and stir the spinach constantly. It takes only few minutes to steam spinach. 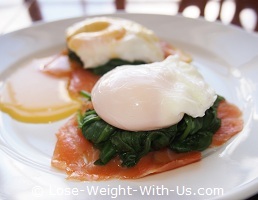 Poach the egg using the whirlpool method we wrote about earlier on the page. Time your cooking such that the spinach and eggs are ready at the same time. Serve the eggs benedict hot with smoked salmon and Hollandaise sauce. Calories: 272 kcal; Total Fat: 18g (Sat Fat 7g); Cholesterol: 358mg; Sodium: 1,442; Total Carbohydrate: 5.1g; Dietary Fiber: 3.2g; Net Carbs: 2g; Protein 25g.